This taxon has listed subtaxa in B.C. Deciduous perennial, palmately branched, from a stout, scaly rhizome, 15-75 cm tall. 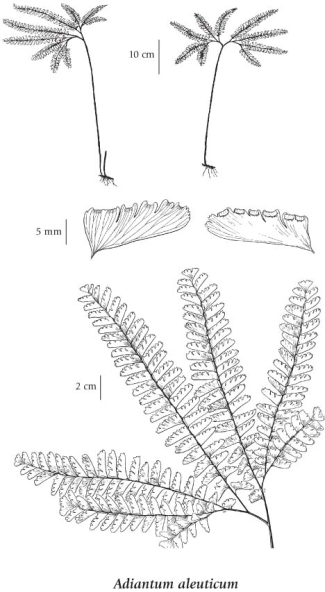 Small plants with small fronds (5 to 15 cm across) and strongly overlapping ultimate segments were described as A. pedatum L. var. subpumilum Wagner. They clearly belong to this species, but no formal nomenclatural transfer has been done yet. This variety is rare on coastal bluffs from northern Vancouver Island south to the Olympic Peninsula, WA. Moist forests, rocks, scree, cliffs, banks and waterfall spray zones in the lowland and montane zones; frequent throughout BC, mostly S of 55°N, infrequent in SC BC; amphiberingian, N to AK, E to SW AB and S to CO, AZ and CA; disjunct E to PQ and NF and S to PA, WV and MI; E Asia. Adiantum pedatum var. aleuticum Rupr.